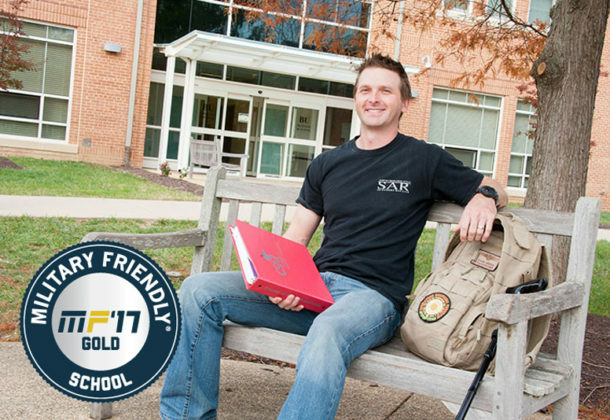 The College of Southern Maryland has received the 2018 Military Friendly school designation from Victory Media for the fourth consecutive year. CSM is one of the largest providers of educational services for current and former service members and their families in Maryland. Military and veteran students represent approximately 10 percent of CSM’s total enrollment. The college is approved by the US Department of Veterans Affairs and the Maryland Higher Education Commission, which allows eligible veterans, service members, and certain dependents to receive VA educational benefits for credit certificate and associate degree programs. CSM’s outreach to veterans includes the CSM Student Veterans Organization and a lounge where student veterans can gather to study and socialize. The college also has hired veterans affairs coordinators to advise students. The Military Friendly school designation comes from Victory Media, which surveys thousands of institutions and assembles information that is provided to service members and their families, helping them select the best college where they can receive the education and training needed to pursue a career in the civilian workforce. Schools are evaluated using both public data sources and responses from a proprietary survey completed by the school. Student survey data was also taken into consideration for the designation. Final ratings were determined by combining the institution’s survey scores with the assessment of the institution’s ability to meet thresholds for student retention, graduation, job placement, loan repayment, persistence (degree advancement or transfer), and loan default rates for all students and, specifically, for student veterans. More than 1,400 schools participated in the survey, with 941 schools earning the designation. For more information, click here. For information on CSM’s Veteran and Military Support Services, visit the college’s website.